RECMAR Products is recognized as an ISO 9001:2015 and IATF 16949:2016 certified company, compliant to the most recent standard updates. The company has maintained ISO 9001 and ISO/TS 16949 certifications since 2007 after operating as a QS 9000 compliant company for many years prior. These certifications serve to validate RECMAR's commitment to quality, continuous improvement, and customer satisfaction. Rigorous third party audits of policies and procedures, operations, management, and personnel are required to earn these recognitions, and our customers can rest assured that the products and services provided by RECMAR Products meet these world class standards. 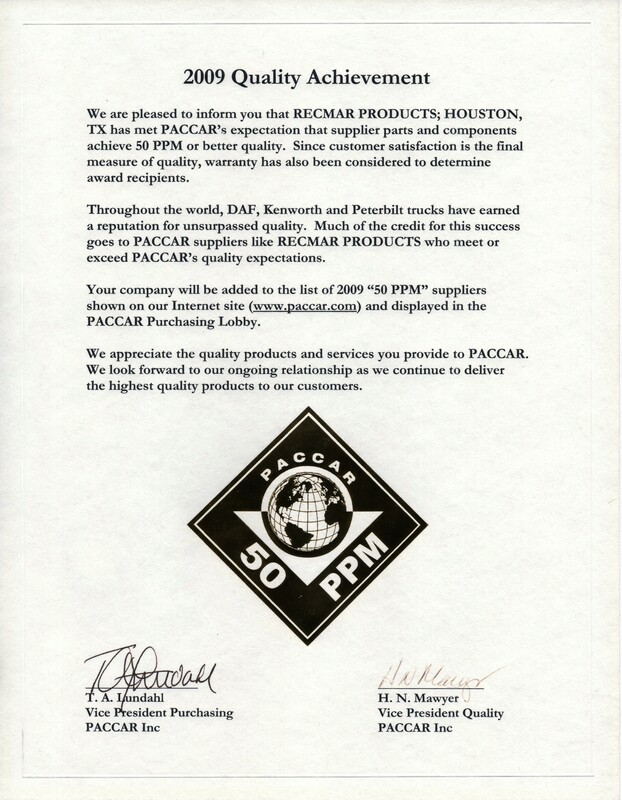 RECMAR Products is proud to have earned additional recognition from its customers for the level of quality offered through our products and service. PACCAR is a global technology leader in the design, manufacture and customer support of premium trucks under the Kenworth, Peterbilt and DAF nameplates. With a strong focus on customer satisfaction, PACCAR sets stringent performance targets focused on Quality, On Time Delivery and Warranty Performance. 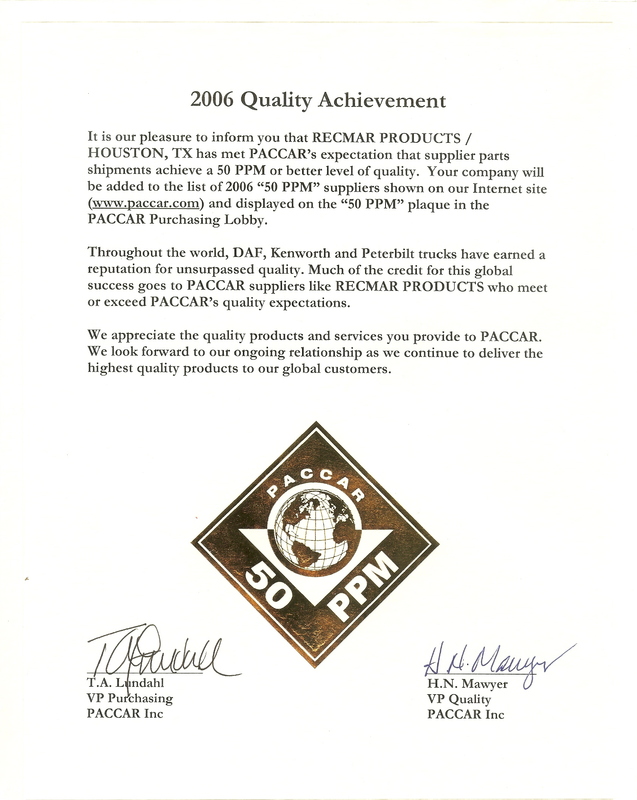 In 2006, PACCAR established a 50 PPM award to identify suppliers who meet their expectations of limiting defects to 50 parts per million. In 2016, PACCAR shifted the bar even higher, requiring performance of 10 PPM. To be recognized, a supplier must operate near perfection – 10 or fewer defective parts for every million parts shipped to PACCAR. Gulfstream sets the World Standard in Business Jet Aviation. As the leader in industry, the company’s quality standards are set incredibly high. Other manufacturers in the industry recognize the status of suppliers who earn Gulfstream Approved Supplier certification. 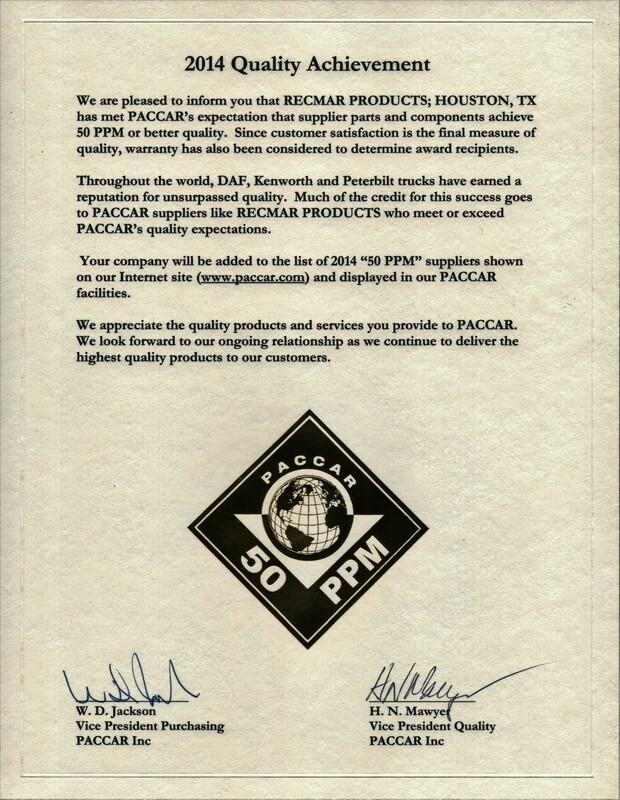 RECMAR Products has been a certified Gulfstream supplier since 2010.